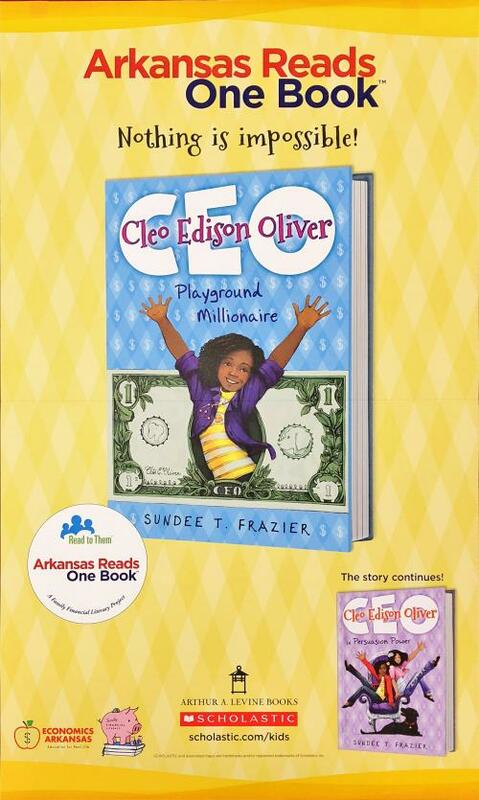 Through a family financial literacy event titled Arkansas Reads One Book, the Magnolia School District is partnering with the Read to Them and Economics Arkansas organizations to provide kindergarten through sixth grade students and parents/guardians with one copy of the book, Cleo Edison Oliver, Playground Millionaire, written by Sundee T Frazier. The book is designed to be fun for readers. In addition, it incorporates cross-curricular content including business terms, mathematics, financial planning, and marketing. East Side Elementary School and Central Elementary School will kick off this project on Tuesday, May 1, by presenting students with a copy of the book and a packet of information including a family guide. Parents/guardians are encouraged to read with their children daily according to the reading schedule. In addition, teachers will invite community members to participate as guest readers in classrooms. Watch the Magnolia School District website and Facebook page for resources and daily economic concepts. We hope you enjoy this exciting family financial literacy project!